Now that we're done with Ships, it's time to talk about the smallest miniatures on the table - Squadrons. And we are going to start with one of the two squadron types that came within the starter kit, the Imperial's TIE Fighter. 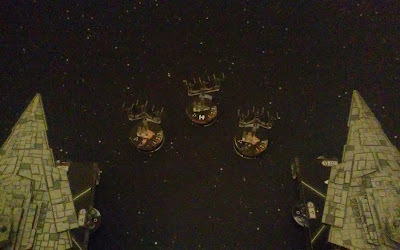 Howlrunner, TIE Fighters, and Mauler Mithel fly in with a pair of VSDIIs. Squadrons are the best at anti-squadron, which is something we can see immediately by looking at the TIE Fighter. Not only is the TIE Fighter's 3 Blue anti-squadron dice (average 1.5 damage) better than any ship's anti-squadron armament, but it also gains the keyword SWARM, giving you a re-roll when you are attacking a ship that is engaged with another fighter. Note: The key is that the enemy squadron must be engaged, not that there is another SWARM squadron nearby - you can engage the enemy squadron with any other squadron, even one that is HEAVY. TIE Fighters also have a movement value of 4, allowing them to move in any direction up to distance 4 on the other side of the range ruler. For comparison to the maneuver tool, distance 4 is just a bit farther than a Speed 3 maneuver. Remember this when you are sending your squadrons into an engagement, it is very easy to fly too far ahead and get away from your slow moving VSD carrier. Hull for the TIE Fighter is a modest 3, the lowest in the game. TIE Fighters do have the capability to theoretically one shot another TIE Fighter, so keep that in mind when you send them into an engagement. Finally, the TIE Fighter also has an Anti-Ship armament of 1 Blue die (average 0.5 damage). This isn't exactly anything to write home about, but if you have a death ball of 5 TIE Fighters doing 2-3 points per round, they can be a cheap and effective 40 points of Superior Positions free victory tokens. Fans of X-Wing will probably immediately recognize the name. In Armada, Howlrunner returns with a similar boost to the squadrons near enough to benefit - any friendly squadron with SWARM at distance 1 adds 1 Blue die to it's attack pool when rolling an anti-squadron attack. Howlrunner also introduces something unique pilots all share - they have defense tokens to offset their increased cost for similar hull stats. Howlrunner's stats are otherwise identical to an ordinary TIE Fighter, but come at an increased cost - 16 points to the TIE Fighter generics 8. Her defense tokens go a long way to mitigating the increased cost with enhanced survivability. She has a Brace token, as well as a token unique to squadrons at this point - the Scatter. The Scatter token allows a squadron to exhaust it to cancel all dice results against it. Though, a reminder, that you use it after the opponent resolves their accuracy results. This means that the Scatter token is extremely effective against single shot Anti-Squadron shots from ships, and amazing for that moment when your opponent rolls nothing but hits on his attack roll. While Howlrunner works well with regular TIEs, she also can work wonders with TIE Interceptors, which we will get to in a later discussion. Another name that should be familiar to X-Wing players, Mauler Mithel comes with the same stat line as the standard TIE Fighter. At 15 points, he also comes with the same defense tokens as Howlrunner - Brace and Scatter. Unlike Howlrunner though, his special ability isn't a buff to other squadrons. After he completes his moves, any enemy squadron that is engaged with him suffers 1 point of damage. A few things to note about this damage - it is not an attack, so abilities that trigger on an attack do not occur. Gallant Haven does not protect the damage from happening. Defense tokens cannot be spent to prevent the damage. COUNTER attacks do not happen. He moves, enemies take damage. There are some excellent synergies with Mauler and Admiral Chirneau, as he lets Mauler move even when engaged. This lets you engage into a furball with Mauler, possibly as your last activation of a turn. Then activate him early the next turn with a squadron command for another damage to every enemy in the furball, followed up by his actual SWARM'd attack. Not too many enemy squadrons can hold up against that sort of punishment. Well, that's it for this round of discussions... or is it? Did someone say BONUS DOUBLE UPDATE? That's right! In honor of over 3000 visits to the Steel Squadron HQ, you get a bonus update on the X-Wing Squadron! You should revisit the effectiveness of each squadron type after each wave is announced. Each wave introduces new combination synergies that can dramatically change the effectiveness. Or at the least, post a comment at the end that the latest waves haven't changed their use.